Robert Inman has written screenplays for six motion pictures for television, two of which have been "Hallmark Hall of Fame" presentations. 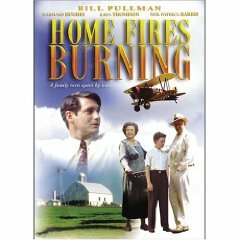 Home Fires Burning -- Hallmark Hall of Fame, CBS-TV, 1989, adapted from his novel. Winner of a Silver Medal from the Houston Film Festival. Now available on Netflix. A Son's Promise -- ABC-TV, 1990, starring Rick Schroeder. Based on a true story of a Georgia youth who fought to keep custody of his six younger brothers. Cries from the Heart -- CBS-TV, 1994, starring Patty Duke and Melissa Gilbert, who join forces to help an autistic child deal with a terrible secret. My Son Is Innocent -- ABC-TV, 1996, based on the true story of a Florida youth convicted of a crime he didn't commit. The Summer of Ben Tyler -- Hallmark Hall of Fame, CBS-TV, 1997. Starring James Woods and Elizabeth McGovern. Winner of the Writers Guild of America Award for Best Original TV Screenplay of 1997. Humanitas Award nominee. Family Blessings -- CBS-TV, 1999. Adapted from the best-selling novel by LaVyrle Spencer. Starring Linda Evans. Home Fires Burning is available on DVD from Amazon.com. All of Robert Inman's movies are shown periodically on cable and satellite channels. Check channel listings for dates and times.